After its recent redesign, the Android market will now offer you books and movies on top of the already familiar apps and videogames. The new look of the app is sleek and easy to navigate. You get all major sections on the left side, and featured apps or multimedia on the right and top of the screen. Each of the major content departments is divided into subsections which can be scrolled horizontally. Accessing content is easy and intuitive. 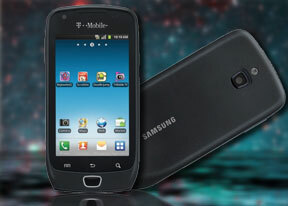 With Android 2.3.3 Gingerbread and a 1GHz CPU on board, the Samsung Exhibit 4G will run any app from the market effortlessly. Even graphic intense games were not a problem for the device. The Samsung Exhibit 4G packs a GPS receiver, which got a satellite lock in about five minutes with A-GPS turned off. A-GPS can speed this up quite a bit, but requires Internet access. Google Maps is on board, complete with Navigation, including public transportation directions from the latest update, which can do voice-guidance for free. Availability is not a problem in the United States. Google Maps has evolved a lot since it came into being. The latest version offers a nice 3D looking render of the buildings. With such a complete package which keeps getting better, Google Maps needs no alternative at the moments. Should you decide that you want to be different, you can explore the Android Market for other options. Just keep in mind that they will be paid and will come short from the Google experience. As a carrier branded device, the Samsung Exhibit 4G comes with several preloaded apps which are worth noting. The AllShare app for example allows you to stream your Samsung’s content to another device over your Wi-Fi network. Its setup is easy and intuitive. Lookout is an app which helps you backup your device and protect it from the lately popular malware and spyware attacks on Android. Its most important option however, is helping you locate your precious droid in case it is lost or stolen. Wi-Fi calling has been a T-Mobile staple for some time now. For an additional $10 towards your wireless plan, you can make unlimited calls over a Wi-Fi network. The setup is easy and the potential to save money is huge. T-Mobile TV is a self-explanatory service. For an additional $10 a month, you can stream most of the popular TV channels in the United States straight to your droid. The zippy HSDPA network makes this an easy exercise. All you need to do is be prepared for a rapid battery drain. T-Mobile name ID is an app which displays the name and location of each unknown caller. The location is based on the area code of the caller’s phone number. You get a preinstalled video chat client, courtesy of Qik. Given the recent developments regarding Skype and Google Talk video calls however, we doubt that you are going to need it. Samsung Media Hub is a multimedia store which you can access through your Exhibit 4G. You can download or stream the latest movies or TV shows. Given the recent improvement of the Android Market however, the app is up against some serious competition. And finally there is the standard Samsung diary app on board. It allows you to share your thoughts on a daily basis, and add pictures and multimedia to them. The current weather display is a nice touch too.